I take my pre-flight skincare ritual very, very seriously. Here’s how I keep my skin clear and glowing no matter how early the flight or hot the climate. I have a 6 a.m. flight tomorrow—which means I should be packed, relaxed, and ready to go. But (spoiler alert!) I’m not: which means I’m scrambling, stressing, and so not ready. In a concerted effort to lower cortisol levels and prevent a pesky pimple from popping up right before vacation, I hop in the shower. Cleanse, of course, then exfoliate from head to toe. Marinate my limbs in Super Rich Olive Body Lotion and make a mental note to decant some Summer Shine Body Lotion (I’m going to Puerto Rico, after all). 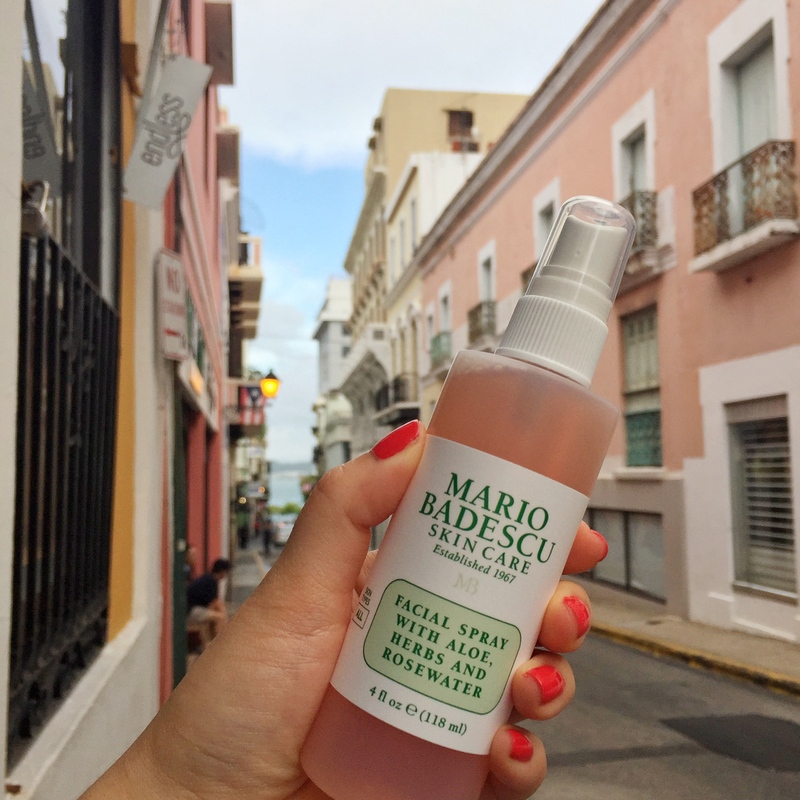 Slap on Enzyme Revitalizing Mask, because, Puerto Rico. I’m not a morning person. But I’m a responsible adult who’s dutifully committed to her pre-flight skincare routine, so after silencing five alarms, I force myself out of bed and into the bathroom. On travel days, I swap my usual gel cleanser for a creamy one. Cabin air is extremely dehydrating, so the goal is to maintain as much moisture and dew factor as possible. Seaweed Cleansing Soap is the usual go-to. It smells divine—like the beach—and though that plus would’ve been a defining factor in my youth as a measure of a ‘good’ product, I’m now a hair wiser. I give my skin a generous misting of Facial Spray, apply a few drops of Vitamin C Serum, then layer Seaweed Night Cream on top. Stick with me here: yes, it’s morning, but I’m off-roading here for the sake of maintaining a glow from boarding to landing. It’s oil-free (which is perfect for the oily-skinned or breakout-prone) but still rich enough to keep me dewy for the next few hours. No makeup for me, just another liberal misting for good measure. I guzzle a liter or so of water before heading out the door. Delayed boarding, what else is new? My brother (did I mention this was a family vacation? Well, it is.) gives me major side-eye as I wipe down both our seats and tray tables… so I make a mental note to keep on the in-flight skincare regimen to a bare minimum. Luckily for him, my untraditional moisturizer method keeps my skin happy and I’m too enthralled by Beauty and the Beast to check on my skin. The furniture and cutlery are fighting the townspeople now! (Still on Beauty and the Beast). I’ve asked for water at least four times since the snack carts started rolling, so the flight attendant just hands me a whole water bottle. Good skincare is half the battle when it comes to keeping skin in tip-top shape when traveling. The other? Staying hydrated. Hellooo, San Juan! Though you’re a grey for my liking, I love you and your palm trees. What I don’t love, though, is having to wait for my room because I all I want need to do post-flight is shower and wash my face. So while my skincare sits in my suitcase, which is held hostage at concierge, my mom, dad, brother, and I wander the streets of Puerto Rico in search of food. Which is easy—restaurants line the streets of the Condado Plaza. We have our room keys—allelujah! I practically wrangle my carry-on out of the bellhop’s hands and sprint to the elevator. I’ve been marinating in sweat and sweats (my airplane outfit of choice) for past few hours and all I want is to swap it all for a sarong and sandals. Reach for Drying Mask and don’t look back. I even get my brother to mask with me. So, as we sit, mask, and refresh before dinner, I unpack and line up my Mario minis along the bathroom counter. Facial Spray goes into the fridge, of course. Not a pimple in sight on me or the brother—and we went in on the mofongo and tostones at dinner last night. Moral of the story? Always travel with Drying Mask, just in case.